The Arcopedico L18 Black Mary Jane from Arcopedico® will fit perfectly with your on-the-go lifestyle. Leather-look or faux suede Lytech® upper with an adjustable Mary Jane strap and elasticized collar for a snug, secure fit. Lytech® is a stylish and comfortable blend of Lycra® and polyurethane that is water resistant and breathable. The Lytech® material stretches and forms to the foot so it’s great for hammertoes and bunions. Utilizes Arcopedico’s patented twin arch system which supports the arch of the foot for the life of the shoe. Removable textile insole provides all-day cushioned comfort and lets you add a personal orthotic. Durable synthetic outer sole absorbs impact and provides grip for a confident stride. 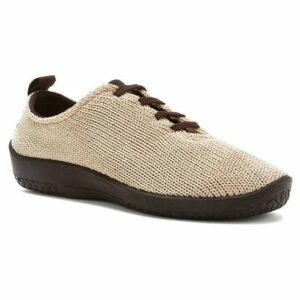 Vegans can wear these shoes proudly since no animal products were used in the manufacturing process. All of the ‘L’ shoes from Arcopedico® are very flexible and lightweight which make them ideal for travel. There’s no need to worry about getting them dirty because you can toss them in the washing machine and let them air dry. You won’t regret getting a pair.